This is a natural cooling and healing gel. Used to hydrate damaged skin after exposure to the UV rays of the sun. 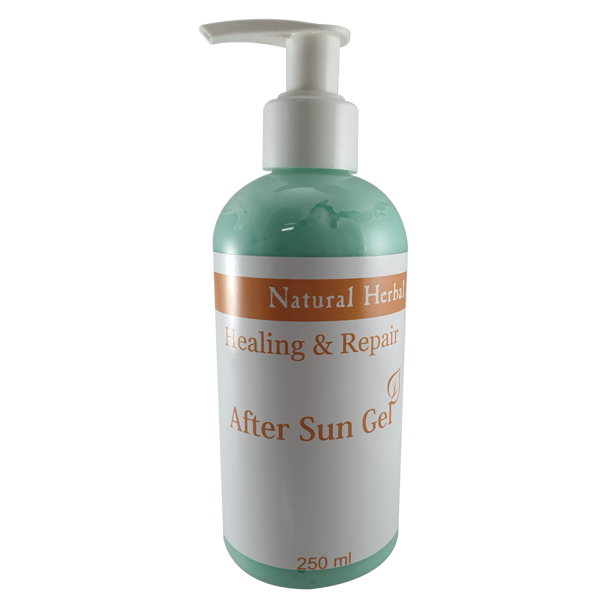 Healing & Repair Range aftersun gel contains Aloe Vera Leaf Juice which has natural cooling, antibacterial and antiviral properties, protecting the skin from damage caused by UV rays and infection. It contains high values of antioxidants salicylic acids vitamins and minerals increasing the healing benefits. Reducing the damage caused by sunburn. Apply a generous quantity of Healing & Repair Range Aftersun to the affected area. Wait till dry before covering. Leave on. Draws out the burning sensation of the sun burn. Providing a protective layer keeping the skin moist and bacteria free. Reducing possible scaring.